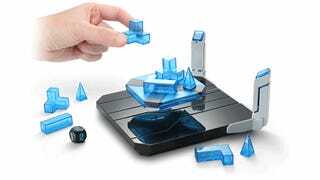 First revealed at Toy Fair 2014 way back in February, ThinkGeek's Hoverkraft Levitating Construction Challenge game is finally available. It promises all the fun of Jenga and Tetris, but with the added twist that you have to build your tower atop an unstable platform that's actually floating. So all that fun instead becomes maddening frustration. Rolling an included die has players either adding one of the 24 translucent plastic blocks to the tower, or taking one away. Like with Jenga, as long as the tower is still standing after their move, the game continues. But when a player brings the tower crashing down, they're declared the loser, and the game is over.